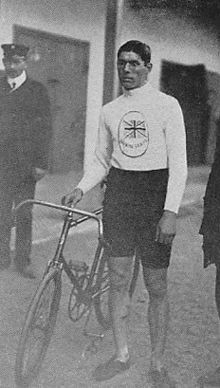 Leonard "Leon" Lewis Meredith was born on 2nd February 1882 in St. Pancras, London, and although successful at roller speed skating was also a very successful cyclist. He became interested in cycling in 1901and it was whilst on a bike ride from London to Brighton that he met members of the Paddington Cycling Club. They were so impressed with him that they invited him to join their club. He rode his first race in the Finchley Harriers meeting at the track in Kensal Green, North London, winning the one mile handicap. By the end of the season he was the national paced tandem champion over 50 miles. As he became more and more successful on a bike he was subsidised by his uncle, a builder, who paid for him to travel across Europe and race amongst the elite. This subsidy also allowed him to have a personal trainer and masseur. Three years later in 1904 he won the first of his seven World cycling championships at Crystal Palace, London in the 100km motor paced event. The race itself was eventful in as much as he fell from his bike on the banking,.turned somersaults as he did so and suffered cuts. Immediately shouting for another bike he re-mounted and went on to finish over 7 minutes inside the World amateur record. In 1908 he was selected to represent Great Britain at the Olympic Games. As part of the British pursuit team with Ernie Payne, Ben Jones and Clarence Kingsbury, Meredith was triumphant and won gold. It was around this time that Meredith was also starting to show a keen interest in roller speed skating. In March 1910 and skating for the Goys club he became the first ever winner of the 5 Mile British Championship and so became the first recipient of the English Sports Cup (now the senior mens 15000 metres elimination British Championship) at the Maida Vale rink. In February the following year he successfully defended his title at the Olympia rink, this time skating for the Brixton All Blacks. It was his second and final British speed skating title but his association with speed skating did not stop there. First, however, there was the small matter of resuming his cycling for the 1912 Olympic Games. In the team road race he took his second Olympic medal, a silver. 1912 was also the start of another successful turn in Meredith's life. That year he acquired the rights to a patent for a racing tyre and as luck would have it, one of his skating friends was the brother of Joseph Bain who ran the Constrictor Tyre Company in Forest Gate. It wasn't long before Meredith replaced the Managing Director and started to import more and more cycle parts branding them as "Constrictor". Meredith went on to buy a roller rink, the Porchester Hall off Queensway, London. He was still a keen speed skater and to advertise it he set out to break the One Mile and Five Mile British Records. Aided by Bill Skuse who he used as a pace setter, Meredith successfully broke the records on Holland Park (the One Mile) and Maida Vale (the Five Mile). Such was the success of the Porchester rink that Meredith opened another at the Broadway, Cricklewood in North London, which he ran with Skuse. The rink would become the home of one of the most successful speed clubs in the country throughout the '40's, '50's and '60's and responsible for spawning careers for such greats as Denis Hill, Don Brown, Jackie Reeves and Chloe Ronaldson. In 1914 Meredith married Cissie Parkham, daughter of MP for Willesden and Alderman for Middlesex County Council, Charles (later to become Sir Charles) Parkham. After the 1914-18 war Meredith again resumed his cycling and again represented Great Britain at the 1920 Olympic Games. His last race was in 1924 when he set out to break long distance records. The fact he was a double British Champion and the only British speed skater to date to have also won an Olympic gold medal is enough to consider Meredith a British Skating Legend. Meredith died on 27th January 1930 in Davos, Switzerland, on a skiing holiday just six days before his 48th birthday. Despite being tea total and a non-smoker he died of a heart attack but even in just those few years he was associated with speed skating, his activities and achievements paved the way for a whole new generation of skating legends.